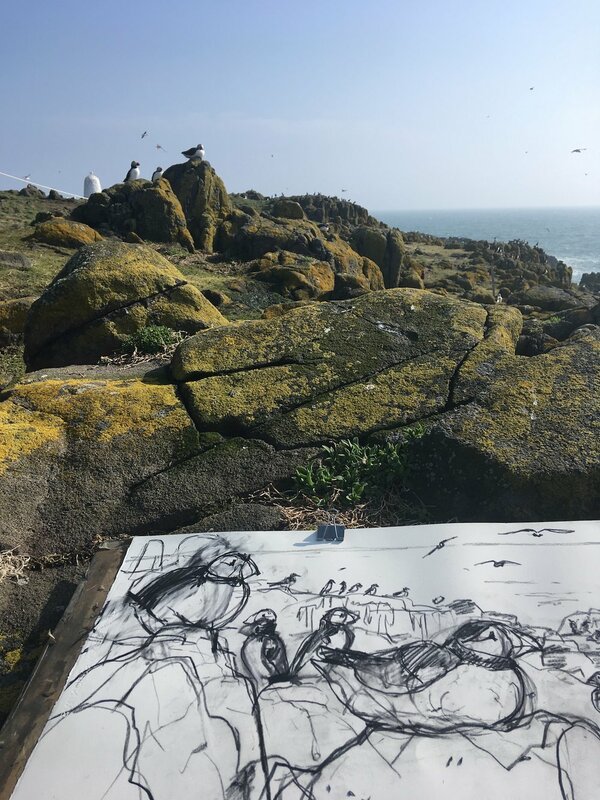 I have recently returned from drawing trip to the Isle of May. (The Isle of May is located in the north of the of the outer Firth of Forth, about 8km off the coast of mainland Scotland. It is 1.8 km long and less than half a kilometre wide.) The Isle of May is a National Nature reserve and home to thousands of nesting seabirds including Kittiwakes, Shags, Guillemots, Razorbills and Puffins. 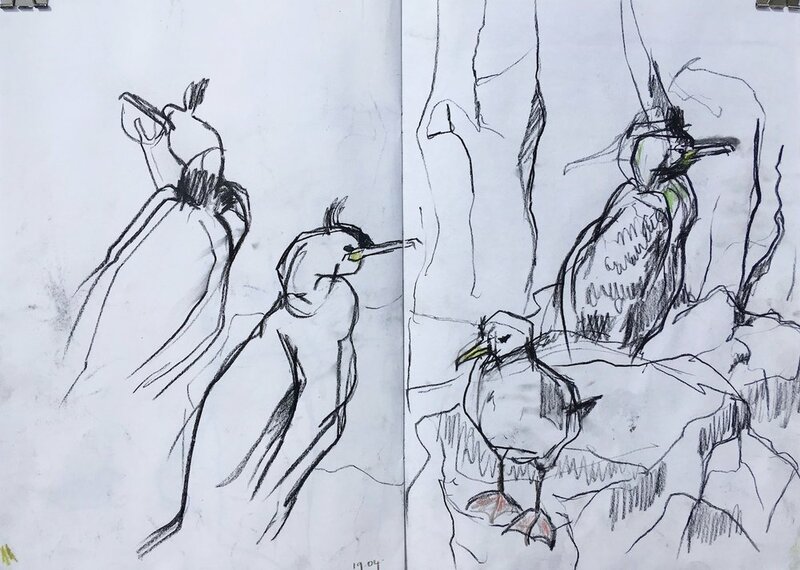 Sketching, puffins in the foreground and a guillemot colony in the distance. On arrival, mid - April, we were warned that the island was still recovering from the effects of the bad winter - waterlogged and little sign of seabirds. However, the very next day everything had changed. One of nature’s miracles had taken place early that morning and thousands of puffins had descended on the island. Walking amongst hundreds of puffins who had just arrived from a winter out at sea was an experience I will remember for a long time. They were everywhere - and as I walked along the path they were flying so close that I could hear, and almost feel, their wings beating above me. The puffins spend the whole year at sea and only come to land when it is time to breed. For this reason they take a little while to settle back on the land and they have a tendency to come and go. But what is strange about this is that, on some days, they actually leave altogether. So, on our second full day, they were around until midmorning and then …they were gone. The island seemed very quiet. This gave me an opportunity to focus on the kittiwakes, shags razorbills and eider ducks who were all busy mating and selecting nesting sites. In previous visits I have been more focused on shags and razorbills, two species I also love to draw. When approaching a drawing I will often start with a simple line drawing. This helps me to tease out what it is I want to draw, to explore the forms and shapes and to find an interesting composition. Sometimes I use this as a way of getting to grips with the form of bird and the sketch is simply a tool to develop my understanding - other times this might develop into a more sustained drawing. Sometimes I will sketch a bird quickly and I sense that the composition will make an interesting painting, so I make further studies of the shapes, colours, details and tones of the surrounding area - even after the bird has gone. I can then use these drawings to inform studio work at a later date. After a few drawings in my sketch book, I was ready to make a sustained piece of work on site. I usually feel quite tense as I start this process, and am keen to work quickly whilst my subject matter is still there! However this drawing was such a pleasure to make. I was still reeling from the total wonder of sitting so close to puffins that had arrived on the island just hours before. My aim is to create work that is more visceral than precise, in order to capture something of my experience and a sense of place. I hope this is conveyed through my work. It was an incredible privilege to be able to stay on the Isle of May for a week and I am really grateful to Leo du Feu for organising this trip and making it possible. Also thanks to Kittie Jones, Nye Hughes, Liz Myhill, Jane Smith and Chris Leakey for their sense of humour and support throughout the week. And finally to the amazing team of folk who live on the island throughout the seabird season, making us so welcome for the week. This is a short film made by Chris Leakey from Scottish Natural Heritage about our stay on the island.